First batch of RevivalDRIVE is almost sold out! Not in stock yet but ship asap, first order in first order out. Housing an unabridged valve amp-style signal path recreated in analogue electronics, the RevivalDRIVE accurately delivers a wide range of British and American amp tones, from clean to fully cranked. With valve and silicon rectifier channels, a built-in mid boost and unique controls that will tailor its output to the amp you’re using, this may be the last overdrive pedal you will ever need. When it comes to overdrive, nothing comes close to the sound of a vintage non-master-volume valve amp. So when we set out to design the RevivalDRIVE, we began by looking not at other pedals but at amps. We listened to and analysed countless classic amps to figure what made them sound so good. Then we figured out how to reproduce not just one but all of those sounds in a pedal, with controls that would allow the player to precisely dial in each one – or to mix and match different elements to create something new. With the Cali76 compressor, we took the sound and response of the legendary Urei 1176 studio compressor and reproduced it in a pedal, following the same analogue circuit topology but adapting the components to work in pedal format. We’ve applied exactly the same approach to the RevivalDRIVE. Using all-analogue components and replacing the valves with discrete transistor-based circuitry, we’re recreated every stage of the signal path you’d find inside a vintage valve amp. This includes not only the preamp, phase inverter, power amp and rectifier stages, but also a synthesised mains power signal and a speaker-emulating reactive load. Accurately emulating valve amp circuit behaviour is just the start. The RevivalDRIVE’s intuitive controls let you play around with different elements of this circuit, effectively redesigning the amp as you go. Change the preamp voicing and “bright capacitor” values to explore a range of British and American amp flavours. Rein in the low end for a lean and defined overdrive or push the bass into brutal distortion. Fine-tune the overdrive’s response to your picking dynamics. Goose up your tone with a mid boost, adjusted to just the right frequency, or blend your dry and overdriven signals together. One pedal, many amps, your tone! 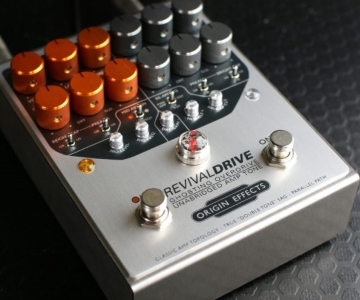 Thanks to its unique design, the RevivalDRIVE is able to recreate aspects of real valve amp behaviour never previously captured in a pedal. Valve and silicon rectifier channels let you experiment with different flavours of power amp sag, while the variable Ghost control recreates the “double tone” or “ghost note” effect encountered when cranking certain vintage amps, subtly thickening up solos. Dual Class-A preamp stages offer realistic gain-staging and natural-sounding clipping, while the phase inverter and push-pull power amp stages provide a realistic tonal response, symmetrical harmonics, subtle crossover distortion and touch-sensitive drive characteristics. Using a built-in reactive load, the pedal also models the interaction between a real valve output stage and a speaker cabinet, delivering amp-like feel and realistic harmonics. We’ve built a range of EQ compensation features into the RevivalDRIVE to make sure it will sound great with whatever amp you’re using – even a flat-response power amp. With most overdrives, the designers have voiced the pedal to work with their own favourite amp. If you happen to use something different, then you’re out of luck. You’re left with a sound that’s either too harsh or too muddy. Worse still, you can end up sacrificing the clean amp settings you want to use in order to accommodate the overdrive pedal. With the RevivalDRIVE, there are no compromises. *The optional front-panel filter controls take fine-tuning the pedal to the next level, with variable shelf and cut frequency controls and a fully adjustable secondary boost/cut EQ. The RevivalDRIVE is packed with ingenious features and subtle touches designed to aid the player and increase flexibility. A set of DIP switches at the rear allow you to turn the Valve Rectifier channel into a second Silicon Rectifier channel and toggle the simulated mains power supply between US and GB frequencies, altering the character of the ghost tones produced. When plugging into a flat-response power amp or PA, you can choose to make use of the RevivalDRIVE’s preamp-style tone-shaping even when the overdrive effect is bypassed.